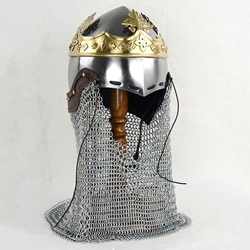 This Royal Bascinet is reproduced from the one worn by King Robert the Bruce as seen on his commemorative bronze statue at Bannockburn battle site. It is constructed from 18 gauge steel and is topped with a riveted crown of intricate brass. A butted mail aventail with a leather band is laced onto the helm and can be removed or placed back onto the helm as needed with lacing through its integrated brass anchoring points. The inside of the helmet has an internal suspension liner of leather which can be adjusted to fit. It also has a leather chinstrap with an antiqued brass buckle. Please Note: You may find that you need to bend open the frontal base of the helmet near the cheeks to fit it on a head as this helmet is designed to fit closely to the head.